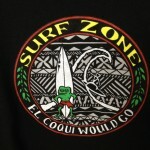 El Coqui' Would Go! New decks from Zero and Slave! The new Ziegler and El Senor 32 collaboration “El Coqui Would Go” hat and t-shirt is now available! We also got in some new Zero decks just in time for the halloween season! Have a mellow weekend! El Coqui would go! Collaboration by Ziegler and El Senor 32! We just got in some new Zero decks! With plenty of skulls, blood, and even a wolfman thrown in, these decks are perfect for the halloween season! Some nice new decks from $lave! Really cool artwork and all sizes above 8.25″, for all the serious shredders out there! Some more sweet new $lave decks! 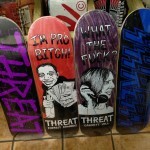 new Threat decks, including the Forrest and Garrett Hill pro models! Get some Oakley compression shorts!